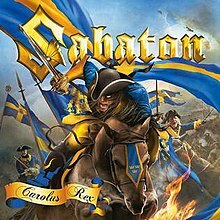 Carolus Rex is the sixth studio album by Swedish power metal band Sabaton. It is a concept album based on the rise and fall of the Swedish Empire, whose monarch Charles XII gives it its title. It was released with both English and Swedish vocals. It is the last album to feature guitarists Oskar Montelius and Rikard Sundén, drummer Daniel Mullback and keyboardist Daniel Mÿhr. It was produced by Peter Tägtgren in Abyss Studios. The album received critical acclaim and commercial success, achieving gold certification in Poland and quadruple platinum in Sweden. A Swedish edition of the album, with Swedish lyrics, is also available. The limited 2-CD mail-order edition of the album includes the English version with all of the bonus tracks and the Swedish version, as well as alternate artwork. On 28 September 2018, Sabaton announced that the album had been awarded quadruple platinum status after remaining on the Swedish chart for 326 weeks, and commemorated this with a number of limited edition versions and merchandise. These were set for release on 30 November 2018, the 300th anniversary of the death of Charles XII. Fellow Falun-based metal band Follow The Cipher, which includes Carolus Rex contributing songwriter Ken Kängström, covered "Carolus Rex" on their 2018 self-titled debut album. Metal Injection's review of the album noted Linda Toni Grahn's version of the vocals sounded "more haunting". Peter Tägtgren – guest vocals on "Gott Mit Uns"
^ Pain interview - Peter Tägtgren (part 3). YouTube. 3 August 2012. Retrieved 19 March 2015. ^ "Sabaton – Official Headquarters Carolus Rex sells gold in Sweden - Sabaton - Official Headquarters". Sabaton - Official Headquarters. Retrieved 19 March 2015. ^ "Sabaton: 'Carolus Rex' Certified Gold In Poland - Blabbermouth.net". BLABBERMOUTH.NET. Retrieved 19 March 2015. ^ "Sabaton – Official Headquarters Carolus Rex Sells Platinum! - Sabaton - Official Headquarters". Sabaton - Official Headquarters. Retrieved 19 March 2015. ^ "Sabaton To Release 'Carolus Rex (Platinum Edition)' In November". Blabbermouth.net. 28 September 2018. Retrieved 29 September 2018. ^ Price, Aaron (1 June 2018). "Album Review: FOLLOW THE CIPHER - Follow The Cipher". Metal Injection. Retrieved 30 September 2018. While the original has more power behind the vocals—this version is more haunting. Grahn adds a different level of depth to the song. The original gave the impression of a song for a destructive ruler; you can hear the power and terror behind that. Yet, Follow The Cipher's version sounds more like a history lesson. This is a ruler who lived in the past, these are the horrible things he did—feel for his victims. It's interesting how giving the same song to a vocalist with a much different style can shift the tone massively. 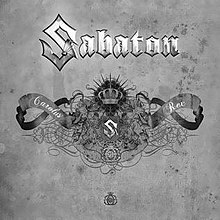 ^ "Polish album certifications – Sabaton – Carolus Rex" (in Polish). Polish Society of the Phonographic Industry. ^ "Guld- och Platinacertifikat" (in Swedish). IFPI Sweden. Type Sabaton in the top right search bar. Click on "Sok" and select "Visa" under Carolus Rex to see certification.